– even in July. After freezing in the water at the other beaches we visited, we decided it was time to try some warmer water. 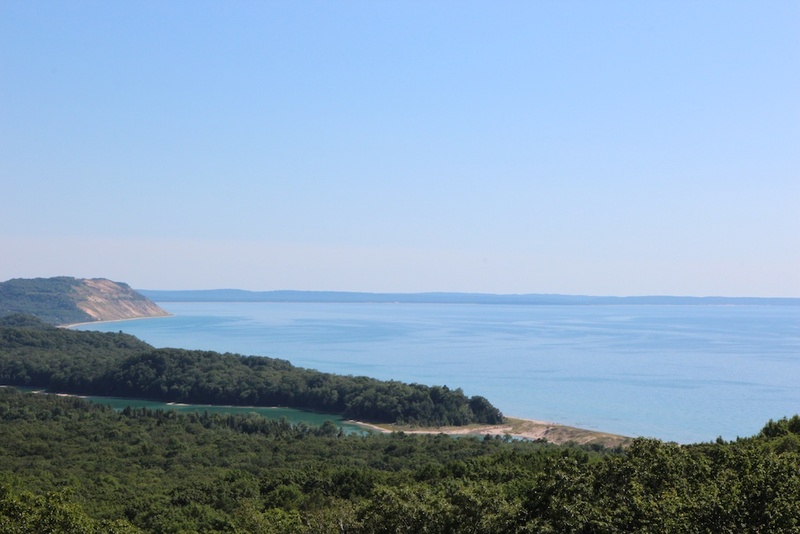 Just south of the scenic drive, there is an inland lake called North Bar Lake that connects to Lake Michigan. It’s an easy drive with parking available, so we headed there in the early morning. This is a shot of North Bar Lake from one of the overlooks on the scenic drive (gives you an idea how it connects to the big lake). There were only a few people on the near side of the lake, so we plunked down our stuff and started trying to catch minnows. After 45 minutes of that, we had once again lost to Mother Nature. The water was indeed warmer than the big lake, and fairly clear for what is essentially a big pond. We then decided to walk around the edge of the lake to the mini-channel where North Bar Lake connects to Lake Michigan. This turned out to be a great move, as this is a prime location for kids to swim and play. The channel, which is probably 100 yards long and 20 feet wide, ranges from 1-3 feet deep at the deepest, so it’s easy for even little kids like Leah to walk and splash and play. While the girls played and swam, I walked through the channel out to Lake Michigan to survey the views from there. There were several families camped out along the channel, but there was almost no one in either direction at the big lake. Views were spectacular in both directions, and I got some good shots looking back along the channel towards North Bar Lake. By the time we headed back to the car (around noon), the parking lot was pretty full.